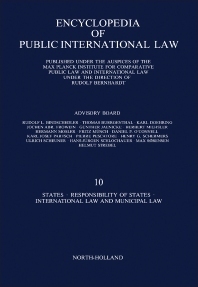 Encyclopedia of Public International Law, 10: States, Responsibility of States, International Law, and Municipal Law concerns States, responsibility of States, and the relationship between international law and municipal law. The publication first ponders on administrative, judicial, and legislative activities on foreign territory, autonomous territories, Barcelona Conference of 1921, border controls, and boundaries. Discussions focus on boundaries as limits of state jurisdiction, permeability of boundaries and transboundary cooperation, impact of the League of Nations and the United Nations, historical evolution of legal rules, and special legal problems. The text then takes a look at colonies and colonial regime, comparative law and European law, comparative law and international law, confederations and other unions of states, and the decolonization of British, Portuguese, French, and Dutch territories. The manuscript examines the unification and harmonization of laws, lease territory, acquisition and abandonment of territory, territorial sovereignty, territorial integrity and political independence, and state succession. Topics include succession in respect of treaties, state property, archives and debts, general characteristics of territorial sovereignty, judicial decisions and arbitral awards, and drafting and interpretation of uniform law. The publication is a dependable source of information for researchers interested in States, responsibility of States, and the connection between international law and municipal law.